On December 17th, comedian Yamasaki Hosei held a press conference in Osaka, where he announced that he will integrate his name into his stage name as a Rakugo-ka (a comic story teller), "Tsukitei Hosei", starting next year. Yamasaki stated, "It's been decided that all my activities will be under 'Tsukitei Hosei' starting on January 1st of 2013." 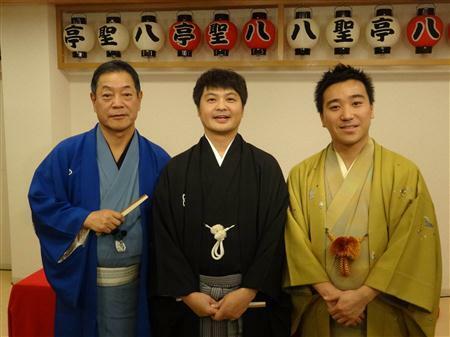 The comedian became Rakugo-ka�Tsukitei Happou's pupil about 5 years ago and received the name 'Tsukitei Hosei.' Though he was using two names properly, because of Happou's recommendation to integrate the names and as he will be 45 years old next year, he has decided to officially change his stage name. Yamasaki clearly said, "It feels like I am graduating from 'Yamasaki Hosei' rather than throwing it away. I will never use the name and have no regrets."